The first Škoda model ever produced, the Voiturette A, will come to the UK for the very first time this weekend to take part in the world famous London to Brighton Veteran Car Run (LBVCR). Laurin & Klement Voiturette A (Laurin & Klement being the original name of the Škoda brand pre-1925), in the city of Mladá Boleslav – where the Škoda factory remains today. 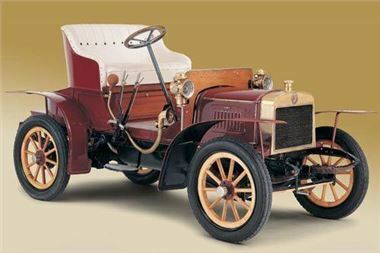 Around one hundred Voiturette A models were produced between 1905 and 1907. The Voiturette A model which will run on this weekend’s LBVCR was built in 1906. It took five years to restore and is housed in the Škoda Auto Museum, situated within the grounds of the main factory in Mladá Boleslav, Czech Republic. The rear-wheel drive Voiturette A (which is French for ‘little car’) is powered by a four-stroke, two-cylinder SV engine, which produces 7bhp and has a top speed of 25mph. There is no battery, only a low voltage magneto, and there are no spark plugs, but an originally used ‘breaker’. The Voiturette A will be on view to the public in Regent Street, London on Saturday (6 November) during the LBVCR International Concours event (11.00-15.00). The start of the 77th running of the LBVCR, the world's longest running motoring event, takes place on Sunday (7 November) in Hyde Park (07.00-08.30). From there, around 500 cars will make the 60 mile journey to the finish on Madeira Drive on Brighton’s seafront (10.00-16.40).